There are people and organisations who’ve amassed some very large collections of rock memorabilia. Of course organisations with big pockets will always have a huge advantage over an individual, but that hasn’t stopped some people spending serious money on their collections. What you’ll find is that these people are interested in collections, whether for personal or commercial reasons. This isn’t investing as such, with the aim of selling later. With individuals it’s often a deep obsession. For instance, one man in Los Angeles has spent more than a million pounds on Beatles memorabilia, whilst an American dealer claims to have more Bruce Springsteen memorabilia than Springsteen himself. Yet another collector, a Who fan, owns many of their instruments, to the extent that he began learning to play on one of Pete Townsend’s old guitars (he made no comment about whether that helped his playing). To be fair, people like those are in the minority – they have (or get) the money to feed their obsession (at that level, you can’t call it a hobby). But the fact is that they exist, and that’s just a small sampling of people who spend a lot of money on rock memorabilia. People who can afford to indulge – and even a few who can’t, really – will do so. But even millionaires can’t compete with billionaires, and Paul Allen, who made his fortune with Microsoft, has a much larger fortune than most. 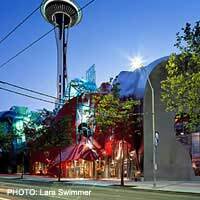 His creation, the Experience Music Project in Seattle, in its uniquely designed building by the Space Needle, boasts one of the world’s best collections of rock memorabilia – in fact, it’s a museum that celebrates rock, and the pre-rock, era. You can find everything from the very first electric guitar to clothes worn by funk bassist Bootsy Collins, a poster advertising a Dylan concert to the control desk used by Jamaican dub engineer King Tubby (which had previously belonged to reggae legend Lee Perry). That it cost millions to acquire it all is beyond question – there are galleries after galleries, including the Hendrix guitar that’s Allen’s pride and joy. But money was never an object. Many different buyers contributed to this project, working in the U.S. and abroad, over several years. Although EMP is a museum (with fairly stiff entry prices), it also stages concerts and is an educational resource. But more than anything it feels like a giant playground with all these objects on display, where baby boomers can get close to their heroes. And that, of course, is the secret of these collections, private or otherwise. It’s the sense of closeness with the idol, of connection. For some, even the billionaires, it’s what they need in life. Ever been to a Hard Rock Café? If you have, you’ll know that the main attraction is the collection of rock memorabilia each restaurant has. The chain, which includes hotels and music venues along with 124 restaurants spread around the globe, was bought by the Native American Seminole tribe in December 2006 for just over £500 million. The first place opened in London in 1971, but didn’t begin collecting rock memorabilia for another eight years (for a while, until they began buying centrally, people from different restaurants would compete against each other for items at auction). In 2001 their collection was estimated at $32 million, including the bus used by the Beatles for Magical Mystery Tour and a leather jacket once owned by U2’s Bono. Although it might be the food that lures people in, for many it’s a chance to see the memorabilia display in each restaurant that’s the draw. Curiously, the Hard Rock has developed its own memorabilia and collectors, who want the tee shirts and badges from each location, a curious little subculture within rock memorabilia.